Built in a bygone era, and completely remodeled, Driftwood cottage is one-of-a-kind. It sits on a private beach with uninterrupted views of the Long Island Sound. Walk down 8 steps, and you're on a lovely, white sand beach. Go for a dip, build sandcastles, read, nap and enjoy stunning sunsets. Sleep to the lulling lapping of the waves. 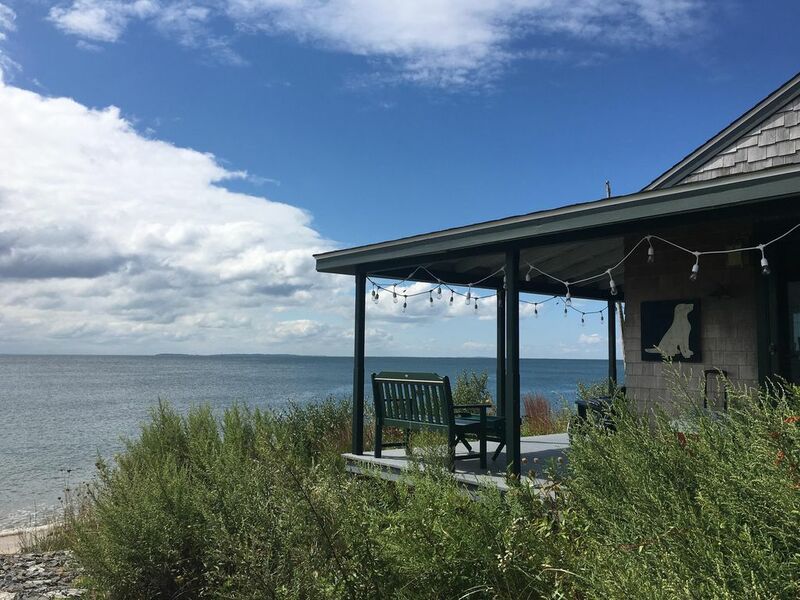 The Cottage has weathered wooden shingles and a deep green trim, and it's bordered by tended gardens on one side and native grasses and flowers in front - between the porch and the sea. The 900 square foot interior has been remodeled and now has a sophisticated open feel. We've kept a few of the antiques, but otherwise the furniture is new. All rooms have views of the ocean and open into the living area and the fully-equipped modern kitchen. It's one level with 3 bedrooms and 1 bath. All bedrooms and beds have ocean views. The master bedroom has a queen bed. The other bedrooms have just been redone - more pictures coming soon -into a queen; the other now has a two twins that can combined to make a king. There is a new truly comfortable sleeper sofa for additional guests. The bathroom has a shower and bathtub. There are wood floors throughout, except for the tiled kitchen and bathroom. A short walk down the beach takes you to a nature preserve where there is birdwatching and access to Harkness Memorial State Park, with its grand lawns and stunning gardens. And, behind the Cottage, there is an enormous lawn where you can kick around a soccer ball, throw a frisbee or a football. It is shared with families who also live around this cul-de-sac. If you feel like an outing, you can visit nearby historic towns, like Stonington or Mystic, take a ferry and then bike around Block Island, shop at farmer's markets, attend outdoor concerts, tour wineries, sail, kayak, fish, play tennis or take in a play at the Eugene O'Neil Theatre, a mile away. When you're ready for a day in the city, consider Providence for surprisingly exquisite food, art and entertainment. (We love New Rivers for dinner.) You might also enjoy an evening at Waterfire, bonfires floating down the Providence river in the city center. Or catch the train to NYC for gourmet dining, shopping, and a world class art and theater scene. On the way you could check out New Haven, see the centuries-old Gutenberg Bible at the Beineke Library and eat the best pizza this side of the Atlantic. When you return, you can throw fresh produce on the grill and chill out on your private porch with a glass of whatever suits you. You may even make s'mores over your own bonfire on the beach. In the cooler months, you might enjoy cozying-up around the old stone fireplace after a day of leaf-peeping along Connecticut's riverways. Driftwood is well-loved and cared for, full of happy memories. We hope you, too, make your own wonderful memories here! You may just want to come back year after year! Driftwood was built by a decorated Navy soldier in 1952. His daughter was like a grandmother to our children and a mother to us. We have been blessed to be coming to Driftwood since our children were small, and hope that one day our grandchildren will play in the waves! We inherited the property recently. While our hearts ache missing her, we know she loved sharing Driftwood with others who also loved it. (FYI - There aren't any vrbo reviews because until now, this property has been rented privately to friends and family who have returned, year after year, some for 50 years or more.) So, welcome to Driftwood! We hope sharing this place with you will help to make the whole world a little better! It's a little piece of heaven - a sanctuary from the busyness of the Northeast. From the porch, take in the sea and sky. We wake early and stroll down the beach to birdwatch at Harkness. We spend the days playing or resting, according to our own hankerings, and we gather for sunset cocktails and seafood fresh off the grill. There's something so wonderful about walking a few paces from the beach, dipping your sandy feet in the iron tub and rinsing off in the outdoor shower. We've never slept so soundly and peacefully. We also love friendly our friendly neighbors. They all have a way of respecting your privacy, but making you feel welcome. There is no AC. Usually the ocean breeze is enough. But in the event that you have a heat wave, there are 3 portable fans and a vintage fan just in case there's a heat wave. Please minimize the use of the washing machine for the sake of the septic system; leave beach towels outside; remove sandy shoes and rinse off when coming in from the beach. Atlantic Broadband is our new Internet provider. Renovated kitchen. Full size fridge, soapstone counter tops, stovetop, oven, dishwasher and all the cooking and eating utensils for 8. Atlantic Broadband is our new Internet and TV provider. We have two blue tooth speakers, one of which is water resistant and can be used outside on the porch—the black one. We have a Blue Ray disc player; You’ll also find an HDMI cord for streaming. We have several cherished antique classics; and then lots of fun beach-reads. Feel free to exchange a paperback beach-read, take one and leave one behind for others. Lots of puzzles, games and art supplies available. We have two blue tooth speakers, one of which is water resistant and can be used outside on the porch—the black one. You can connect to your music library, e.g. Spotify, Itunes, etc. We’ve collected a few of our family’s favorite movies. Maybe you’ll enjoy them, too! Great property at a beautiful location, friendly and accommodating hosts. This house is immediately overlooking the beach and in my estimation within a couple dozen feet of the water at high tide. The cottage is small but very comfortable, and certainly large enough for 3 of us to spend the week of 11/25 to 12/2. Whoever did the insulation gets an A+, even though there were a few very windy nights with a lot of crashing waves, I don't recall ever feeling even a hint of a draft. Combined with the fireplace, that makes this a fine all season rental. The only negative, but not enough to bring this down from 5 stars for us... the bathroom fixtures are packed pretty tight and may be difficult to negotiate for someone with long legs. Overall, our week at Driftwood was enjoyable and we would recommend staying there if the opportunity occurs. We absolutely loved this place and cannot wait to come back. I brought my entire family, including twin babies and a dog, and we felt right at home. The view is priceless and the environment is very tranquil and serene. I am literally going to book it again for the Spring. The owners have made it very easy to feel at home. Bravo! Thank you for making this place available. A perfect place for relaxing on the beach. The house was clean, well supplied, and comfortable. You can’t beat the sound of waves easing you to sleep every night. Perfect hideaway for our honeymoon. Even when raining so peaceful to sit on the window seat & watch the waves. Had beach almost to ourselves. Wonderful to be right on the ocean. Very well-appointed and attractive cottage. Very clear guide to the property & the area. We only spent a few days at Driftwood but we made memories that will last a lifetime. From falling asleep and waking up to the sound of the waves, having coffee on the porch, neighbors that made you feel right at home, everything was just perfect. The property is well taken care of, very organized and had everything you need. Harkness State Park was also a plus. You can walk right down the beach and visit its beautiful gardens and mansions. It was definitely the house with the best view and location. Just a few steps away from the water. It was our first time staying at a waterfront property and we loved it so much I got emotional when we left. Can't wait to go back someday. A piece of my heart is at Driftwood. Thank you Annie and family for opening your doors to us and allowing us to have this experience. Connecticut is a small state in New England which is densely packed with unique attractions, breathtaking natural beauty, and diverse museums. You can go zip-lining, golfing, sailing, fishing, dine in an elegant restaurant or feast on great clam chowder in a waterfront shack, all in one day. Settled by Dutch, and covered by fragrant maples and ancient oaks, Connecticut is the home of Yale University, Peabody Museum, Mystic Aquarium and Lake Compounce. Near the Driftwood Cottage the formality of garish affluence fades. The moneyed commuter enclaves like Greenwich and New Canaan, turn into relaxed seaside towns. Mansions give way to clam shacks. Kayaks outnumber yachts. This is the slice of Connecticut we know and love. About the farthest west we venture is to New Haven to wander through Chapel Street’s indie boutiques under the shadow of Yale’s neo-Gothic buildings. But to this day, the real reason to visit New Haven is the pizza, which — sorry, New York — is the best in the country. Frank Pepe started it all in 1925, when he fired up his coal oven and started making tomato pies with a thin crust — a local style known as “apizza.” They are now legendary, drawing everyone from the food critic Alan Richman to Bill Clinton. The stretch along Route 1 from Guilford to Old Saybrook is a favorite. Roll down the window, get a whiff of salty air and feel your tires ripple over the steel drawbridges that cross the inlets and marshlands. Canoes flit along tributaries, and cruisers and sailboats decorate the Sound. You may want to hit the state’s largest public beach, at Hammonasset State Park. Beyond the maritime influence, what makes this outing distinctly Connecticut is the mix of antique and bric-a-brac stores, 17th-century homes and cemeteries, ice cream stands and book barns. There are bait-and-tackle shops, and farm stands selling strawberries and squash. Town centers — like the one in Madison, where you’ll find the beloved independent bookstore R. J. Julia — are lined with American flags. Roses poke their heads through white picket fences while lush oaks and elms and the occasional purplish orb of a massive copper beech collide beautifully with the blue summer sky. It is small-town America at its best. The picturesque landscape continues along Route 156, where you can kayak the Connecticut River Estuary Canoe and Kayak Trail, past regal heron and fishermen looking to land striped bass. Or you might take the route to the Hallmark Drive-In, a landmark in Old Lyme that has sold homemade ice cream for 100 years. Nothing says summer more than licking a mint-chip cone at a weathered picnic table. The final stretch of Connecticut’s coastline is about as close to heaven as you get — a belief confirmed by a hand-painted sign nailed to a tree in the sleepy town of Noank: “This is our little bit of heaven; so please don’t drive like hell through it.” It cautions the parade of cars flocking to Abbott’s Lobster in the Rough, a seasonal restaurant at the water’s edge reached by a small, winding road. But you can’t go to Connecticut and not have a lobster roll. And as all the Japanese tourists documenting their meals with digital cameras attest, the quarter-pound of succulent, buttered lobster meat at Abbott’s, sculptured into a perfect round puck and served on a seeded hamburger roll, fits the bill. Past downtown Mystic’s upscale boutiques lies Stonington, the last town in Connecticut. Out on a peninsula, a lonely stone lighthouse, which dates to 1840 and has seen everything from British bombardments to Category 3 hurricanes, stands across from a wee public beach. In every direction, water. Here, feeling the sun, solitude and sea air, you'll ask yourself, "Why leave now? You might say, "We've just had the best vacation ever, let's stay a couple weeks longer and come back again next year."